Talley's original post of the photos, which she has since deleted, contained the caption: "Prayers for my once in a lifetime dream hunt came true today! Spotted this rare black giraffe bull and stalked him for quite a while. I knew it was the one. He was over 18 years old, 4000 lbs. and was blessed to be able to get 2000 lbs. of meat from him." The images have drawn global outrage, including searing criticism from comedian and animal advocate Ricky Gervais, who wrote on Twitter that the African giraffe population has dropped significantly and face extinction. About 100,000 are left on the continent. In a blistering Instagram post, actress Debra Messing also called Talley a "disgusting, vile, amoral, heartless, selfish murderer." 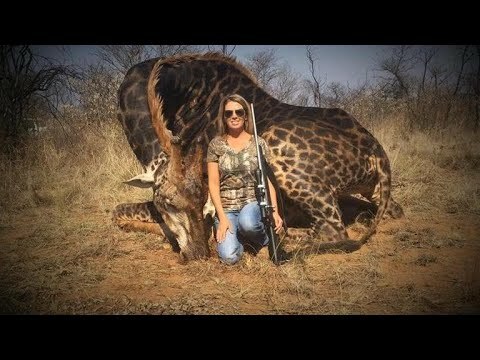 Talley has defended herself, telling CBS News in a statement that the hunt was legal and permitted and the giraffe was more than 18 years old and "beyond breeding age, yet had killed 3 younger bulls ... Now that the giraffe is gone, the younger bulls are able to breed." Paul Babaz, the president of the hunting advocacy group Safari Club International, also defended Talley. He said that the fee for a hunting giraffe is about $2,000 to $3,000 per animal, which provides financial help for the local community. "Without that … the poachers will come in and kill the animals indiscriminately, which is very unfortunate," Babaz told CBS News. Gervais previously wrote in a 2015 Facebook post that he's "sick of trophy hunters trying to excuse their grim sport by saying they provide a service."